George’s prize-winning Raspberry Chiffon Cake has earned her, Bess, and Nancy a week at the Wolfe Culinary Institute in upstate New York. But soon after their arrival, Nancy discovers that ambition, jealousy, and greed are also on the menu. Attempted murder provides plenty of food for thought, but that’s a mere appetizer to the dangers to come. In her search for the chef with a taste for terror, Nancy knows she’ll have to watch her diet and watch her back. The kitchen is crammed with suspects, and tensions are fast coming to a boil. The knives are all sharp, the ingredients are all poison, and the final course—most likely fatal—has yet to be served! "You owe me twenty dollars, Bess," George Fayne said gleefully, waving an envelope in the air. "I'll take cash or a check." Bess Marvin looked up at her cousin with a bored expression on her face. She and Nancy Drew, the cousins' best friend, were sitting in the living room of the Drew house reading magazines. George had just arrived and was standing in the doorway, her cheeks pink from the cold. "What are you rambling on about, George?" Bess asked, turning a page of Creative Cuisine. Her blue eyes lit up. "Oh, Nan, look at this dessert -- Chocolate Macadamia Nut Pie. Couldn't you go for a piece right about now?" Eighteen-year-old Nancy leaned over and studied the photograph, pushing back a lock of her reddish blond hair as she did so. "That looks yummy, all right." George shook off her red ski parka and joined the other girls on the living room couch. "Can you two stop jabbering for one second and listen to some thing really exciting?" "Okay," Bess said, flipping her magazine shut. "Why do I owe you twenty dollars?" "Desserts," George said, her brown eyes sparkling. "The Valentine's Day dessert contest, remember? I won!" She handed Bess the envelope she'd been holding. "This letter just came from the culinary institute that ran the contest." "What are you guys talking about?" Nancy asked. Bess scanned the letter quickly, twirling a lock of her long straw blond hair with one finger. "I can't believe it," she moaned. "Here I set out to make the easiest twenty dollars of my life, and it backfires on me!" George ran a hand through her short, curly dark hair and grinned at Nancy. "You see, Bess read about this contest in one of her food magazines, and she dared me to enter it. It was being run by the Wolfe Culinary Institute -- "
"The Wolfe Culinary Institute in Putney Grove, New York?" Nancy broke in. "That cooking school is really famous. You entered one of its contests?" George nodded proudly. "They asked for an original dessert recipe with a Valentine's Day theme, and three winners would get a week of dessert-making classes. Bess said I couldn't boil water, much less come up with a decent recipe. I guess she was wrong!" "Way to go, George," Nancy said, patting her friend on the back. "So what was this award- winning recipe?" "Raspberry Chiffon Cake," George said, smacking her lips. "It's based on something my grandmother used to make, except I've adapted it for health-conscious people. It's low calorie and low fat." "And low taste, probably," Bess grumbled, fishing a twenty-dollar bill out of her purse and handing it to her cousin. "Sore loser." George grinned, stuffing the money into her jeans pocket. "For your information, my cake tastes great." "So when do your classes start?" Nancy asked George. "February seventh," George replied. "The finale is a big party on Valentine's Day, featuring the three winning recipes." She sat up suddenly. "Hey, guys. I have a terrific idea. Why don't you come with me?" Nancy looked surprised. "What do you mean, come with you? We didn't enter the contest." "I know that," George said. "But from what I understand, the dessert-making classes are open to the public. The other two winners and I just happen to get them for free. Come on -- it'll be great! Seven whole days of baking cakes, pies, cookies . . ."
Her blue eyes twinkling, Nancy turned to Bess. "What do you think?" But Bess was already up and heading for the door. "Excuse me, guys, but I have some major shopping to do," she said over her shoulder. "I'll need a chef's hat, an apron, and maybe some very baggy sweaters, just in case I gain a pound or two." "This place is a cooking school?" George exclaimed. The three girls had just driven up to the front door of the Wolfe Culinary Institute and were getting out of Nancy's blue Mustang. "It looks more like a millionaire's mansion." Before them stood a huge, ornate Gothic structure, much like a medieval castle. It had dozens of turrets and chimneys, and its dark gray walls were made of rough-cut stone. Gargoyles -- eerie-looking animal statues -- jutted out from the eaves. "It is a millionaire's mansion," a voice called out. The girls turned to see a short, plump woman coming around the side of the house. She had spiky red hair and dark blue eyes and appeared to be in her early forties. "That is, it used to be a millionaire's house, about four decades ago," the woman continued, unzipping her black down jacket and pulling off her black leather gloves. "Since then it's been a museum, a corporate headquarters, and a private boys' school. I bought it when I started the institute." "Then you must be Sophie Wolfe, the owner, Nancy said. She introduced herself, then George and Bess. "We're here for the dessert-making classes." Sophie smiled. "I'm so happy you've come. And, George, it's especially thrilling to meet the creator of the fabulous Raspberry Chiffon Cake. Your recipe was a big hit with the contest judges." "Thank you," George said, blushing. "Where should we take our bags?" Nancy asked Sophie. "Right upstairs,'" Sophie replied, leading them through the heavy oak front door. "We've converted what used to be the servants" quarters into dorm rooms. I think you'll be comfortable there." True to her prediction, the girls fell in love with their room immediately. It was airy and artfully decorated, with dark mahogany paneling, purple velvet curtains, and an ornate Oriental rug. Still-life paintings of food adorned the walls. "I'll leave you to get settled," Sophie said cheerfully. "At two o'clock, we're all gathering in the lobby. I'm giving the students a tour of the place. We'll be seeing the grounds as well as the house, so dress warmly." Promptly at two o'clock, the girls made their way down the winding stone staircase to the first floor. There were more than a dozen people in the lobby already. The girls spotted Sophie talking to a petite middle-aged woman. Sophie looked up when she saw Nancy and her friends. "Nancy, Bess, George -- let me introduce you to everyone. She started with the middle-aged woman, whose name was Lila Barnstable. Lila had a silvery blond pageboy and deep brown eyes. "How do you do?" Lila said to the girls. "Are you all training to be professional chefs?" "No, we're just here for fun,'" Nancy explained. "How about you?" Lila smiled. "Same with me. I just love taking classes. You know, cooking, ceramics, Spanish, bridge, archery . . ."
Bess's eyes widened. "You've taken archery lessons?" "Oh, sure -- it sharpens the mind,'" Lila joked. Sophie then introduced the girls to George's fellow contest winners. The first one, Paul White, was a handsome young guy with wavy brown hair, green eyes, and high cheekbones. He mumbled a quick hello, then resumed his conversation with two other young guys, both blond. The third contest winner was a young woman dressed in a patchwork dress and lace-up boots. She was a waitress from New York City named Teddy Angell. The woman flipped back a strand of long, curly auburn hair and rolled her eyes. "It's short for Theodosia. I mean, what kind of parents name their kid Theodosia?" She studied George. "What about you? What does 'George" stand for?' "
"Georgia,'" George replied, smiling with understanding. Next Sophie introduced the girls to Gloria Chen, an attractive woman in her late thirties. She had waist-length black hair and a tall, slim build. "Pleased to meet you,'" Gloria said, shaking hands with all three girls. She adjusted her copper-colored glasses on her nose and focused her amber eyes on Nancy. "You look familiar. Are you with the press?" She added eagerly, "Maybe you're a book reviewer?" "Nancy's a famous detective," Bess piped up. "She's solved dozens of mysteries back in our hometown, River Heights, and lots of other places. You've probably seen her picture in the papers."" Nancy frowned briefly at Bess. She didn't like advertising the fact that she was an investigator, even when she wasn't on a case. Nancy then turned to Gloria with a friendly smile. "I'm here strictly for pleasure, though. How about you?"" But Gloria seemed to have been caught off guard. She turned a shade paler and was silent for a moment before she replied: "I'm a cookbook writer. I'm here to brush up on my dessert-making skills.'" Nancy studied Gloria curiously. What had made her change her manner? The fact that Nancy was a detective? Or was she just disappointed to find that Nancy wasn't a book reviewer who might help her career? 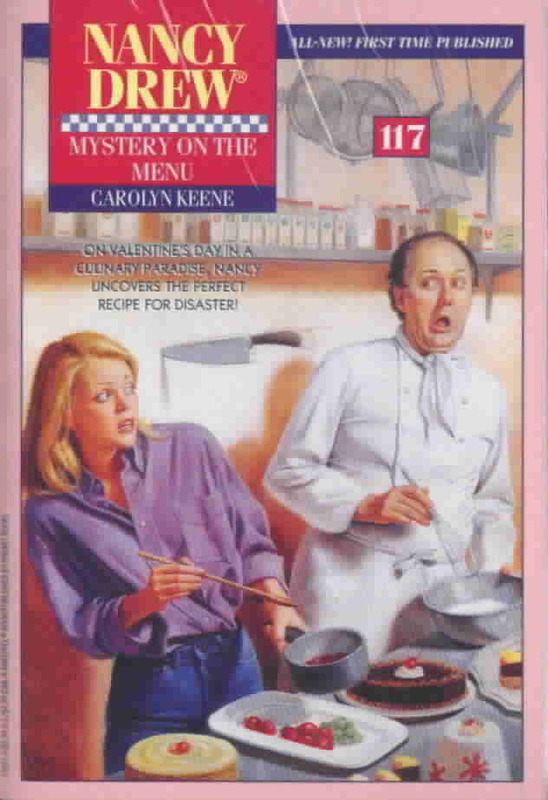 "A cookbook writer!"' Bess was saying excitedly. "We've got scads of cookbooks at home. Maybe some of them are yours. Gloria's eyes gleamed. "Oh, I'm sure of it. I've got seven best-sellers under my belt. How about Gloria's Kitchen -- do you have that one? Or Gloria's Favorite Breakfasts and Brunches?" Bess shook her head apologetically. "No, they don't ring a bell. But I'll take another look when I get home," she added. Sophie interrupted just then to complete the introductions. Nancy, Bess, and George met the two blond guys who'd been speaking to Paul White -- Jamie and Taylor Morris, brothers who co-owned a cafe in Minneapolis -- and the remaining six students, who belonged to an amateur cooking club in New Jersey. Sophie clapped her hands loudly, and the crowd fell silent. "Welcome to the Wolfe Culinary Institute, everybody," she said. "I'm going to take you on a tour of the house and the grounds. Then, at four o'clock, you've got your first class with Regis Brady. Now, let's start outside and work our way in." Sophie headed out the door and everybody followed. Once outside, she paused at the edge of the U-shaped driveway. Nancy looked out at the wide, snow-covered lawn. To the north and south, it was bordered by vast woods; to the west, it led to craggy gray cliffs overlooking the Hudson River. "We have a hundred acres of land," Sophie explained. "Over there, by the woods, you can see where our cross-country skiing trail begins. You're welcome to try it out while you're here." She led the group around the corner of the big house. "Now, there" -- she pointed -- "is our greenhouse. And the wooden case next to it holds our beehive." "Did you say beehive?" Bess said, grimacing. "You mean with real bees? The kind that sting?" Sophie grinned. "They won't sting you if you don't bother them. In fact, they hibernate during the winter, so as long as you don't perform batting practice with their hive, they'll leave you alone."" She added, "We keep bees for the honey. One of my most important rules here at the school is to work with the freshest ingredients. If possible, I think, you should obtain it yourself. It makes you a better chef when you know where the food comes from. We also have a chicken coop, so we can have fresh eggs. And behind the greenhouse there's the vegetable garden, which our year-round students cultivate." Lila Barnstable spoke up. "So you have year-round students?"" "We offer degrees here, just like a university, except they're all in the culinary arts," Sophie replied. "Our regular students are on their holiday break now, so they're not around. We take advantage of their holidays to conduct special events like this one. It's a way to let a lot of other people learn the fun of gourmet cooking." By three-thirty the group had seen most of the grounds as well as the first floor of the house. There were two wings off the lobby: the north wing, which contained ten fully equipped classrooms, and the south wing, which contained offices, an auditorium, a living room, a rec room, and a dining hall. At the end of the tour Sophie guided the students to the large main kitchen, which was adjacent to the dining hall. Nancy had never seen such a state-of-the-art kitchen before. It had gleaming stainless steel counters and enormous ovens with complicated valves attached to them. Four men and two women were moving around the kitchen, busily preparing dinner. Sophie explained to the group that they were the staff chefs, who would be cooking all the students' meals. "Smells yummy," Bess whispered to Nancy. Suddenly a loud voice broke in. "I insist on a green salad with my meal. This is absolutely ridiculous." Nancy's ears perked up. In the corner of the kitchen, a very large dark-haired man was barking at one of the chefs. "But the fruit salad will complement the rest of the dinner so nicely," the chef protested. The large man huffed. "Whoever created this menu is obviously a fool. A fruit salad with Beef Bourguignon? Ha! Don't make me laugh!" Then he stormed dramatically out of the kitchen. "Who was that?" Nancy whispered to Sophie, who was standing right next to her. Sophie smiled weakly. "He's Regis Brady, one of the two guest instructors I've hired for the dessert classes. He's a world-famous pastry chef from New York City. He has a restaurant there called Brady's." She sighed. "I know he comes across as a little difficult, but he's really quite a genius in a kitchen. You'll see." "We have a class with him at four, right?" Nancy said. "Right. He'll be teaching a four o'clock class every day." Sophie nodded. "The other guest instructor, Alicia Jones, will teach the morning classes. She's fabulous, too. She owns a restaurant in New Orleans called the Honeysuckle Cafe, and she specializes in Southern desserts. Wait until you taste her Mississippi Mud Pie -- sheer heaven!" Sophie paused to glance at her watch. "Speaking of four o'clock, it's almost that time now." She clapped her hands to get the group's attention. "Ladies and gentlemen, your first class will be in fifteen minutes in room eleven -- with Regis Brady." After dropping their coats off in their room, Nancy, Bess, and George headed for room 11, which was the fourth room past the lobby in the north wing. The other students were already there, milling around outside the door. "I wonder what we'll be cooking -- " George began. But just then she was interrupted by loud voices coming from a room down the hallway. "You have no right to speak to me this way!" a woman's voice exclaimed. Nancy, George, and Bess exchanged puzzled looks. Nancy noticed that the other students had fallen silent and were listening, too. "You talk to me about rights?" a man said in reply. Nancy recognized Regis Brady's voice. "Ha! You have no right to be at this institute. We both know that you're an impostor, Alicia. And if you know what's good for you, you will pack your bags and leave the premises immediately!"